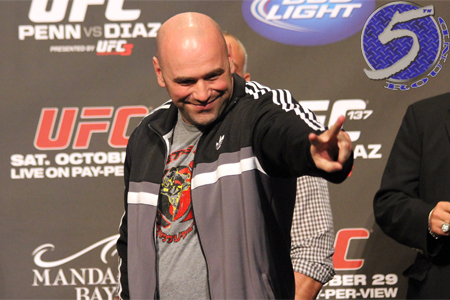 UFC president Dana White (Pictured) has included plenty of behind-the-scenes shots in his past video blogs, but the clip White released Saturday packs some of the most compelling footage he’s ever published. In White’s latest vlog, he’s captured breaking the news to Vitor Belfort that Anthony Johnson, his UFC 142 opponent, failed to make weight by a large margin. White explains to Belfort his options, which includes stopping his own weight cut and prematurely rehydrating like Johnson did. Although Belfort expressed great disappointment and displeasure in the predicament, while chewing on a towel and sharing his own struggles to be on-weight, he ultimately decided to remain professional and hit his mark on the scale. To help ease the pain, “The Phenom” will pocket 20 percent of Johnson’s “show” purse for agreeing to keep the appointment. Fans can also hear the conversation that took place between Johnson and White on stage after “Rumble” tipped the scales 11 pounds over the limit for a non-title middleweight bout. Belfort was right on the money by weighing 186lbs. The “middleweights” co-headline tonight’s pay-per-view broadcast inside HSBC Arena in Rio de Jenairo, Brazil.